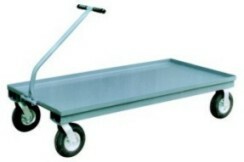 All welded frame construction (except casters, decks and removable handles). 1-1/4 " tubular handle with 1" "T" handle, rubber grips. Platform height - 10" with 6" casters, 12" with 8" casters. 1 1/2" platform lips for retention.